OK – first things first. The macaroni & cheese recipe was part of my trip preparation: use up perishables and buy as little food as possible pre-trip. The recipe comes from April 2012 Cooking Light. I made some modifications to the ingredients because scrounging is perfect for using things up. Steam or microwave broccoli until crisp-tender (I microwaved mine). Cook pasta to the al dente stage, drain and keep warm. Heat butter in pan (could be the same one used to cook pasta) and saute chopped onions until they are soft; sprinkle flour over onion mixture, cook for about one minute, stirring constantly. 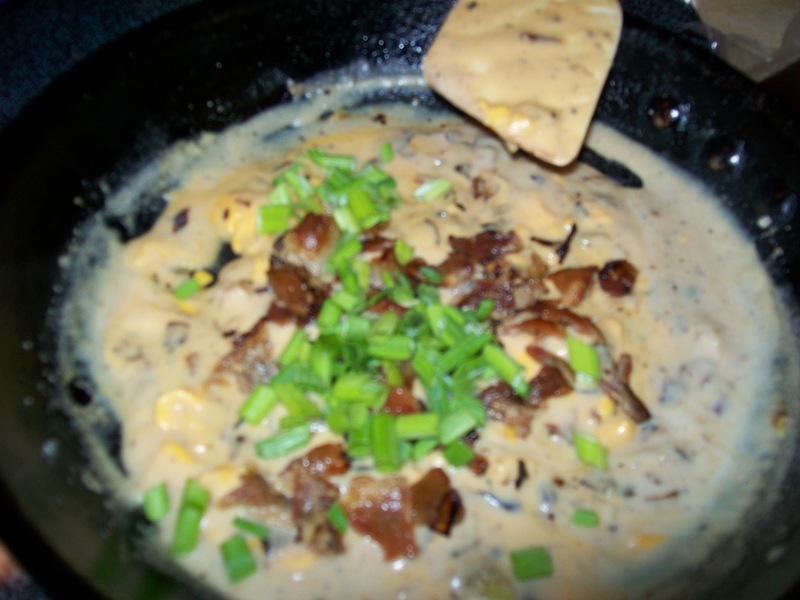 Now this is a challenge with a small amount of roux, so plan on adding the milk soon after adding the flour to the butter. 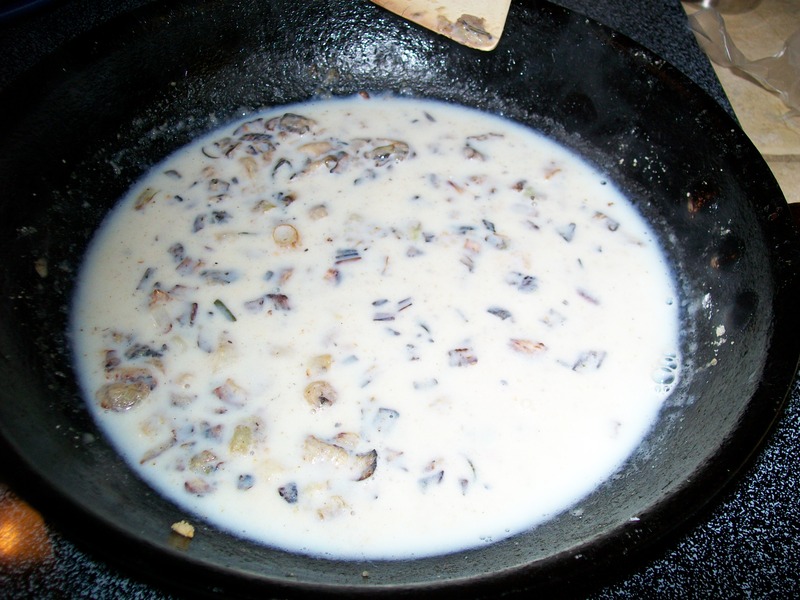 Gradually add the milk and heat mixture until it reaches the boiling stage. Stirring with a whisk is recommended. 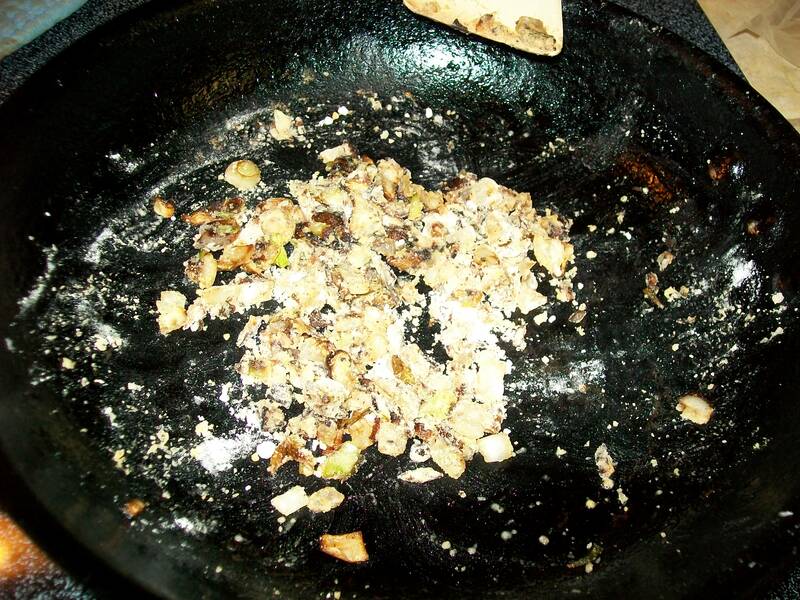 Cook for about one minute until slightly thick, then remove pan from the heaat. 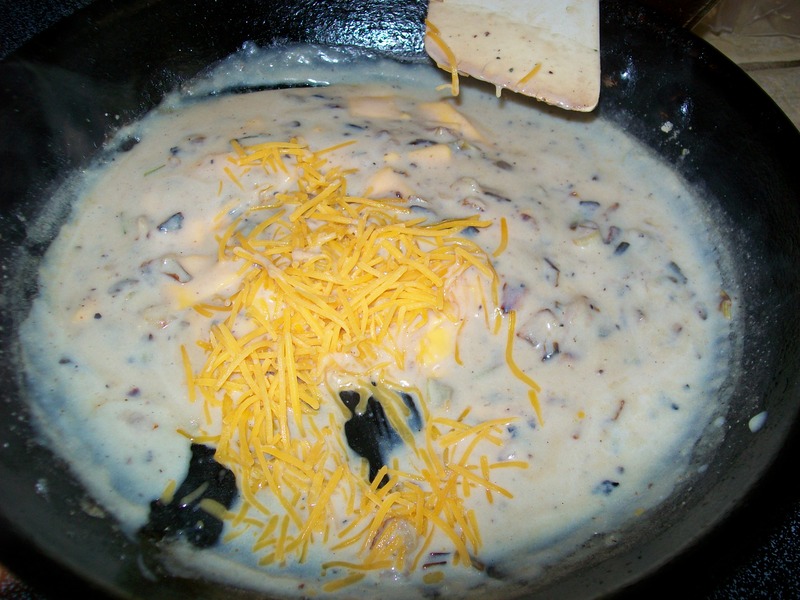 Add American cheese and stir until smooth. 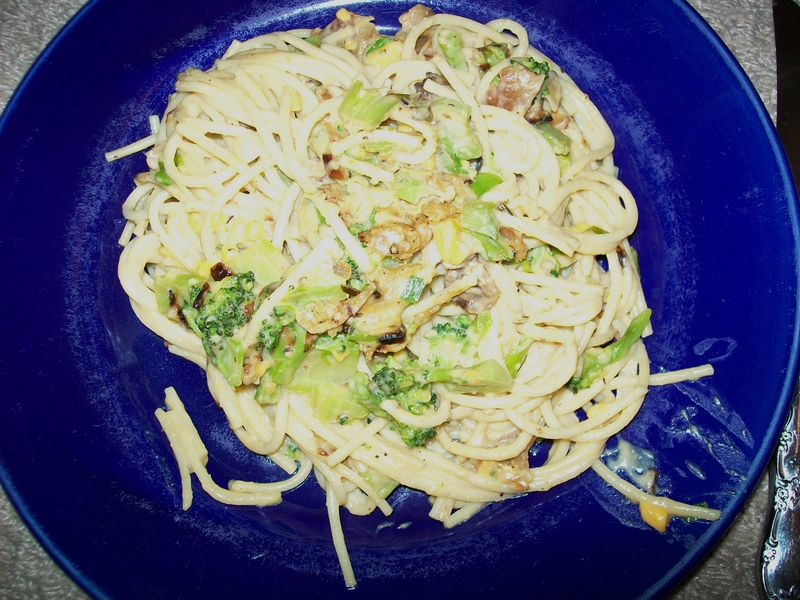 Stir in remaining ingredients, adding broccoli and pasta last. 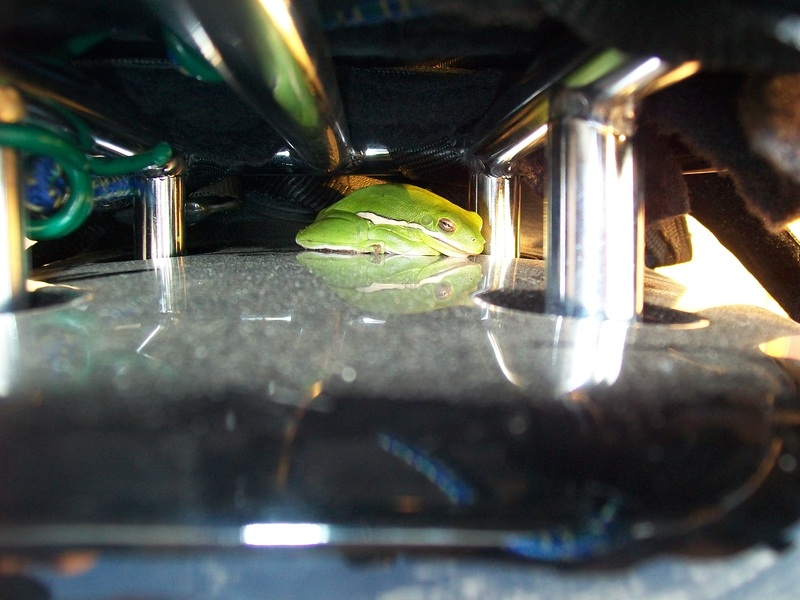 Now the green thing: We were surprised to find a green frog under my luggage rack when stopped for the night Sunday. The little guy traveled over 200 miles in 90+ degree weather! I captured him and put him in the garden next to the motel. And the brown thing: We were on highway 259 in OK, descending into a valley after a steep climb over a 2800 ft mountain (yes, OK has mountains, check the map). Mr. Mike was riding ahead of me. As I rounded a curve, an adult brown bear was standing at the side of the road! I’ve seen deer, moose, coyotes, foxes, armadillos etc while riding, but this was a first for me. Shades of Wild Kingdom! Immediately I slowed down (he was a couple hundred feet ahead) and laid on the horn, which is the same technique used for a dog chasing your motorcycle. The idea is to slow just as they get close, then accelerate away from the animal. Well, fortunately I didn’t have to execute the near stop and acceleration move because the bear ambled from the edge of the road to a shrub about 10 feet away, all the while looking at me. Sorry, no photo. Perhaps the car behind me was able to get one. Next, more things you can’t plan for. So… frog’s legs weren’t on the menu that night? Well…he was kinda small. Frog legs are sold in our local fish markets, however. Several of my LA friends like to frog hunt using a boat and a net! That is a biker frog; that’s the coolest kind of frog. 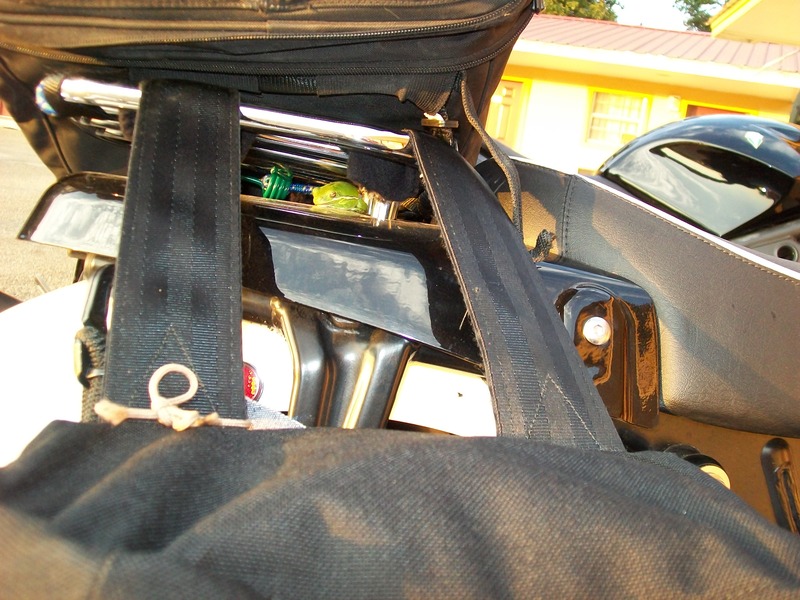 The surprising thing to me was that he didn’t want to leave! 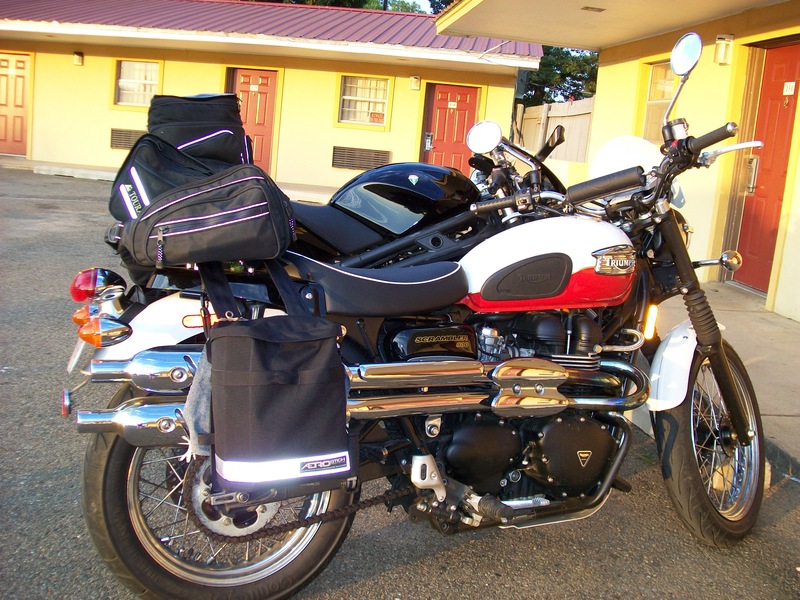 When I plucked him from the bike, he would jump out of my hand and back to a place on the motorcycle. It took several tries before he jumped into a cup and I could move him to the garden. He was a biker frog! And what a story about the frog and the bear. I think I would have freaked out if I saw a bear, but you seemed really calm! Do you see a lot of them? Thanks! Sometimes I do get an adrenalin shot from fear while riding, but not from seeing the bear. Probably had something to do with just finishing trying not to look over the highway’s steep drop-offs around their 25 mph hairpin curves while descending the “mountain”. I don’t like heights, so it was a challenge for me! I bet! Curvy roads and high elevations are scary. Good for you for stepping up and doing it!